Moringa Oleifera is best planted in rows with individuals spaced 2.5m apart, leaving plenty of space for intercropped plants to be grown on the same plot. Moringa is well suited to intercropping with both trees and other food crops, particularly legumous crops (locally grown legume crops include peas, beans, lentils, peanuts, tamarind). 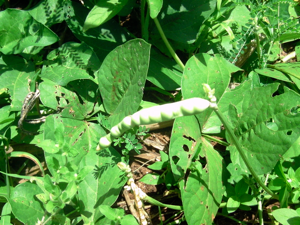 In particular, cowpeas, beans and peanuts are a staple of Coastal subsistence agriculture. Legumes are a well-known means of maintaining soil fertility via their nitrogen-fixing root nodules, and are recommended for crop-rotation and intercropping agriculture. Combined thus with its own nutrient content, intercropping Moringa with these crops would deliver a nutrition-package that would be hard to better, while at the same time delivering a sustainable soil-maintenance regime that would secure small-plot soil-fertility for the long term. Despite Maize-cultivation’s high-labour inputs and low yield outputs, it remains a critical food staple for rural coastal people. Moringa, as with many other woody shrubs and trees does not ideally co-exist with Maize on the same plot. Therefore a switch to Moringa cultivation means eliminating a subsistence staple and with it, a known, if meagre, source of food security. Substitution of this staple for another crop, whatever the merits, must be considered with caution.